Check out our CREDITS. Our musicians have backed up Frank Sinatra, Tony Bennet, Natalie Cole, The Beach Boys, Harry Connick Jr, and more!!! "Bringing the generations together through Big Band music"
The co-leaders of the 15-piece Bill Dayton Big Band, vocalist Sandra Dayton and trumpeter Steve Richwine, are seasoned professionals in the world of music and entertainment. One of the best of the Big Bands, their Big Band is staffed by some of the most accomplished musicians in the business (see Credits page). "To anyone who loves Big Bands and Big Band music, the name of Bill Dayton is a familiar one. Before his death in the late 1990s, Dayton and his orchestra brought the sound of the Big Bands to audiences throughout southern Pennsylvania and northern Maryland, as well as other states within the Mid-Atlantic region. The band also played ballrooms in the Mid-West and West." In short, the Bill Dayton Big Band has performed from Washington, DC to the state of Washington and many points in between. "Now, his daughter Sandra Dayton and her husband, Steve Richwine, are carrying on the tradition as they strike up the popular 1940s-style Big Band once again." "For 25 years, Sandra's mother Phyllis and father Bill fronted the Bill Dayton Big Band, with Bill on saxophone and clarinet and Phyllis singing lead vocals. 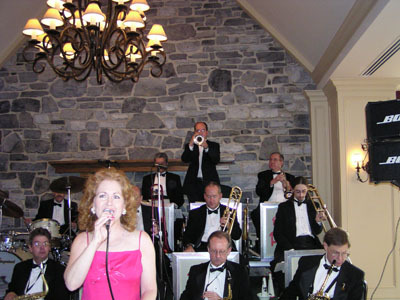 Sandra and her brother Craig grew up with the band; Sandra sang and occasionally performed with them on tour or as the featured Big Band on a Caribbean cruise ship. Craig, a voting member of ASCAP and NARAS, wrote and arranged music for the group." "Sandra, who later went on to work in television and film before becoming a therapist and working in research psychology at Johns Hopkins, remembers learning to dance by standing on her mother's feet as a young girl. 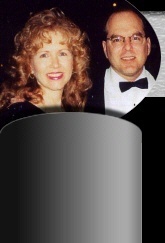 When Bill died from cancer in 1997, he charged Sandra and her husband Steve to keep the band going." "The orchestra, featuring local musicians, as well as former musicians from some of the name Big Bands, played its first gig in 1972. It released three albums under Bill's leadership." "When Sandra and Steve, who majored in music at Towson University, restarted the band, Steve called on old contacts he had at Towson University, as well as contacts at various military Big Bands, such as the Army's Jazz Ambassadors and the Navy's Commodores. The result is a very professional group."